Do you have Fiori Elements applications you use but you really wish you could extend in some way? 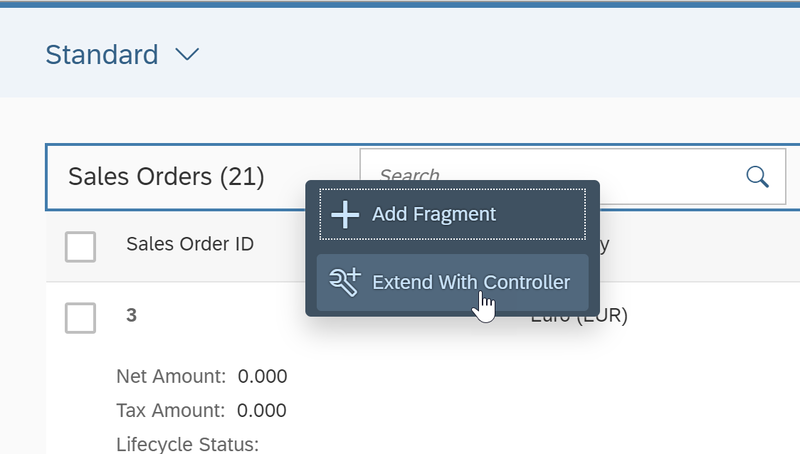 For instance, perhaps you have an application that uses the List Report Fiori Element and you’d like to add a couple of filters to the Smart Filter bar? As of Web IDE version 1809, you can do that! 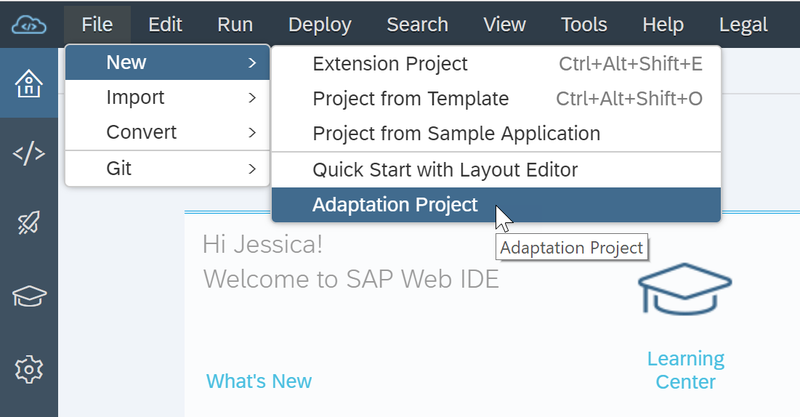 In Web IDE, you can create a new Adaptation Project, indicate what application you’d like to base it upon, and then easily create a new variant, using the new SAPUI5 Visual Editor. When you create an Adaptation Project, you are creating a new variant of an existing application. The app variant refers to the original application but contains separate set of changes created in the adaptation project. Also, an application ID is defined for the variant and needs separate registration in Fiori Launchpad. Name the new project’s name and choose the application upon which you want to base the variant. A new project is created and listed in your Web IDE workspace. Right click on the project and select, SAPUI5 Visual Editor to make changes to the project. This brings up your project in the SAPUI5 Visual Editor. This editor was formerly known as the UI Adaptation Editor, but the name has changed as its abilities have grown. 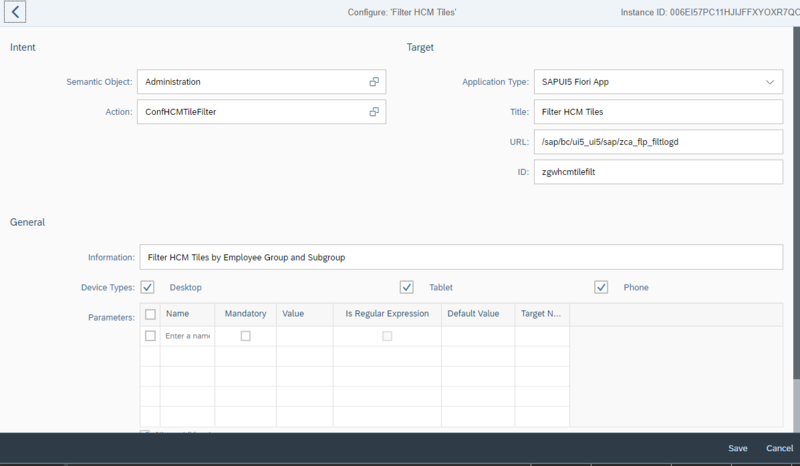 In the past, you could preview the application, make changes to the properties of controls in a Fiori Elements application, see an outline view of the controls and see a list of changes that had been made. That functionality still exists, but now you can also add code fragments and extend with a controller. 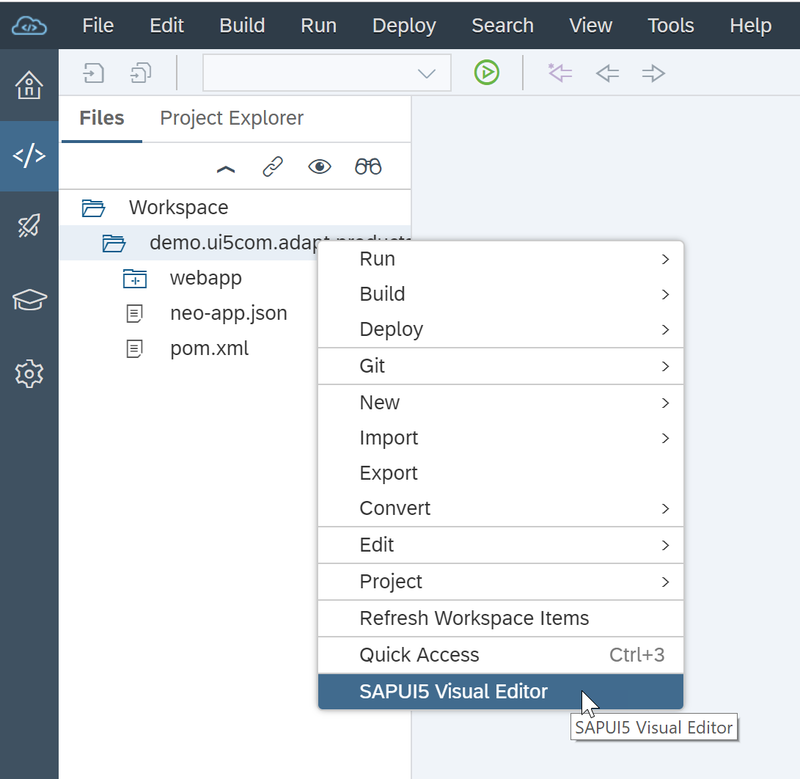 Again, changes made via the SAPUI5 Visual Editor are saved to a Changes folder and saved in the layered repository to be applied when the application is run. From the editor you can preview your changes and ensure everything works. Once you’re satisfied with your changes, you can easily deploy your application and, because it has a different Application ID than the original application, both the original application and the new variant’s tiles will be available. Source applications must be located on an ABAP repository. You can create variants of Fiori Elements based applications. In a future release we will add support of SAPUI5, “freestyle,” applications as well. MMmmm… Now I’m wondering if I can do this on-premise. I think I can. I just haven’t had time to play with our FiORI yet. For new development – right now – we do it in ABAP and then link a transaction to the new tile. I’m trying to find as much as I can – so I can start being more sophisticated. I’ll let you know. I just watched a Teched session about Fiori Elements. Between watching that and reading this – perhaps I can get something accomplished. Hi Jessica, very informative blog. I was having a questions. what is the difference between Adaptation and Extension projects in the Web IDE and will upgrade for any standard application will work for both projects ? TIA. With adaptation projects, you do not need extension points, which is a difference from extension projects as well. Application variants created with adaptation projects will continue to work when the original application is updated, as the changes made in the variant are simply applied atop the original application. Currently, in this initial release of adaptation projects, the original application must use Object Page and/or List Page Fiori elements. In future releases we will support applications made with the Overview Page as well as “free style” applications. Thank you so much Jessica for the information. I assume we are below the required software components. Can you please help and drive me in the right direction to validate the system requirements on non-HANA stack ? I adapted the layout and the controller of a Fiori Elements application created by myself within the same project. I deployed to the ABAP Front-End Server / GW. The controller extension is working, but the layout adjustments not unfortunately. In SAP WebIDE everything was working fine. We have SAP Front-end server 3.0 installed with NW 7.51 Innivation package and SAP_UI 7.51 sp6 components. UI5 version is 1.44. I spoke with one of our architects and the problem is likely that you need to upgrade to a newer version of SAPUI5 — version 1.56 at least. As for my knowledge We can also create app variant with fiori launchpad also from 1809 on premise. I tried so but after creating a app variant one pop up message displays with ”Please contact your administrator to add the tile to Fiori launchpad home page(appid:”************”). I am not able to find that app id and didn’t know how to create a tile with that app id. attaching the the screenshot for ref. if you created an extension project and deployed to ABAP repository, then the app ID displayed in the dialog needs to be added in the FLP Designer into the target mapping configuration the Tile refers (plus referring the SICF end-point of the application deployed. ) I assume. Thenyou create a tile referring the target mapping. If this is a kind of other in app extensibility feature(I am not aware of due we are not on HANA or S/4HANA), then it might you need to refer the target mapping of the standard application in your tile, and add a kind of ID parameter in the tile configuration. We are not on the minimum system requirement level, so I cannot test this for you. But looking in that direction would be a good idea. In what way did you create the variant? Was this from within the application (ie launching the application from Fiori Lauchpad and then selecting Adapt UI from the Me area) or from Web IDE? 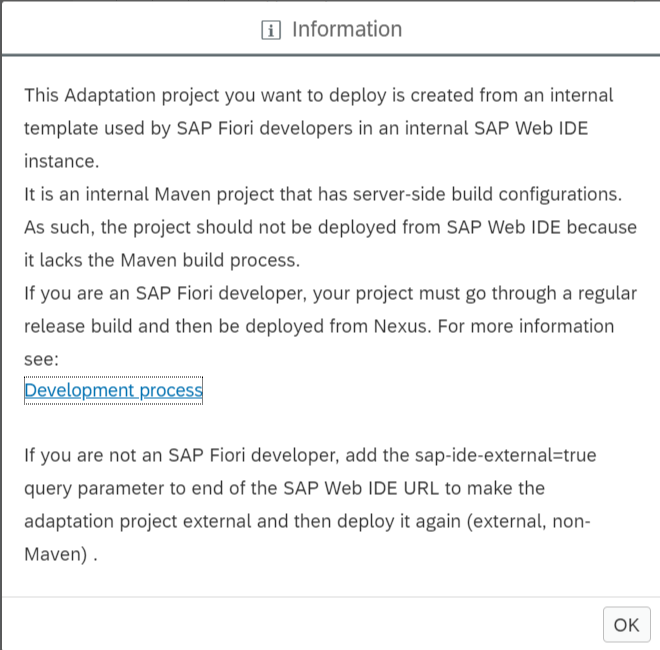 I created the variant through fiori launchpad by selecting Adapt UI. Okay, if you did it via the Key User adaptation (also known as Adaptation at Runtime), then the variant was created and got an automatically generated application ID. You’ll need to contact the administrator of your FLP to get them to add that new variant to the catalog (so that people can see it as an app to add to their FLP). 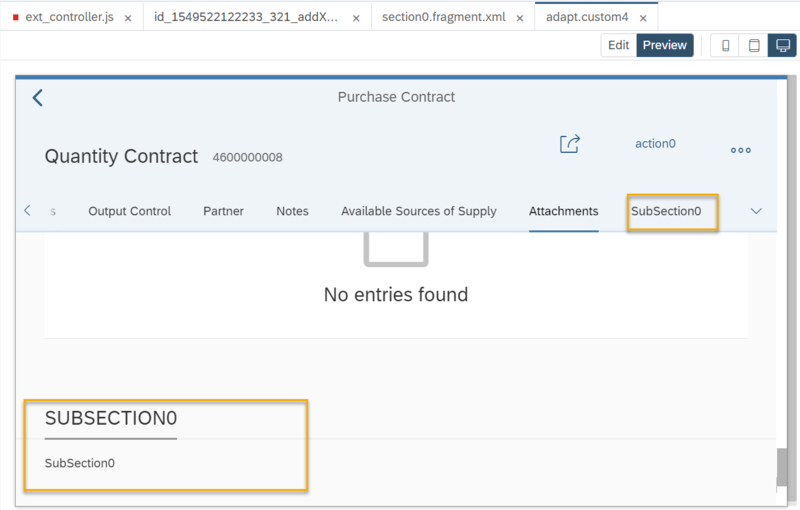 I have tried to extend the section of the Fiori Element application (Manage Purchase Contract Version.2) but the changes are not reflecting. I’m not sure if there is any issue with the application or may be I’m missing something. Can you please share any useful link/document/information to extend the section of the application using Adaptation project? Is the original application in an on-premise ABAP system? Did you create an adaptation project from the original application? What types of changes are you trying to make and what changes aren’t working? When I first was learning how to use adaptation projects, I would run in to situations where the controller extensions I added didn’t appear to work and the reason was that I had put the wrong project name in the code. I.e. the project name in the code did not match the actual project name of the adaptation project in which I was working. Yes. Original application (Manage Purchase Contract Version.2) is an on-premise ABAP system. Yes. Based on the above step mentioned in this blog, I have created adaptation project from the original application. I’m trying to add new section at index 10 in the object page. Changes are not getting reflected when I run the adaptation project or do preview. I faced a similar issue when I tried to add a new section via fragment. The reason why it was not working for me was incorrect control aggregations in the fragment.xml. After I fixed the aggregations it started working for me. Please refer the following screenshots for fragment.xml code snippet and the added section. Are you still having the problem? I sent you a direct message with some suggestions. This is a really informative blog. I was able to follow through all the instructions that has been provided here for adaptation project but I am now stuck as to how to deploy the adaptation variant. 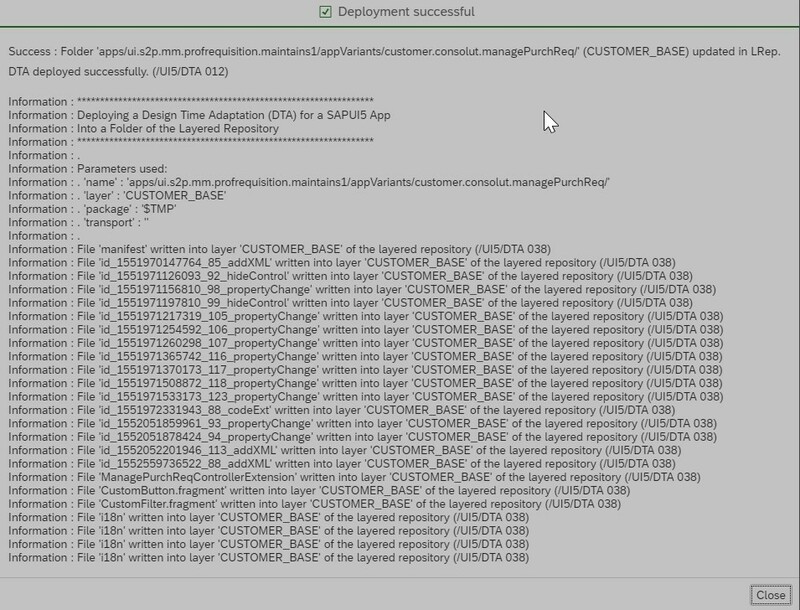 The deploy option in WEBIDE gives me two ways to deploy i.e. 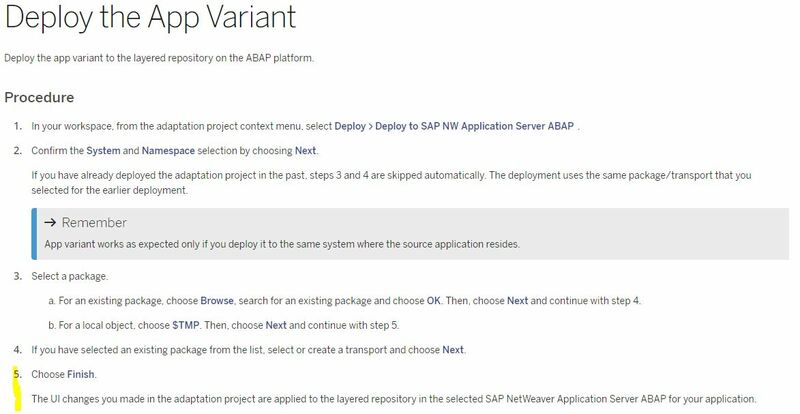 ‘Deploy to SAP NW Application Server’ – Could not figure out how to proceed here as it only gave me an information dialog having link to navigate to ‘Development Process’ which did not seem to have any information on deployment of adaptation project. It would be great if you could guide us on this deployment process for the adaptation variants from WEBIDE. 2. Confirm the System and Namespace selection by choosing Next. If you have already deployed the adaptation project in the past, steps 3 and 4 are skipped automatically. The deployment uses the same package/transport that you selected for the earlier deployment. Next and continue with step 4.
b. For a local object, choose $TMP. Then, choose Next and continue with step 5. 4. If you have selected an existing package from the list, select or create a transport and choose Next. SAP NetWeaver Application Server ABAP for your application. But, selecting this option results in an information dialog as shown below. Since I am not getting any option to confirm system and namespace as suggested in step 2, I am unable to proceed further. Is there an explanation as to why I am getting this information dialog instead and how to proceed from here? very interessing blog. Thanks a lot. I’ve created an adaptation variant in WEBIDE and deployed to SAP NW Aplication Server. It was successfully – I got information that my change files were uploaded. How can I now configure a tile using this app variant? Where could I see the app variant id? Sebastian Wennemers Can you please take a look at this? Thanks! as said before thank your for your really informative blog. Right now I`m facing exact the same situation as Anastasiia. I’m wondering how the changes are applied to the adapted app on the launchpad. In this blog it sais, as for my understanding, that the changes are applied automatically after deployment. Unforunately nothing happened to the app on the launchpad nor does the “Adapt UI” editor offer me a new “App Variant” while using the “Adapt ui at runtime” functionality. I’ve tried with another App and figured out hopefully how it’s working. After deployment you have to configure a tile with your variant. In manifest.appdescr_variant file you get an App ID. This App Id (Variant ID) must be set as ID in a new tile configuration. So a new version of App with your variant is created. The experimental way show that variants created like a DTA aren’t displayed in the Overview of App Variants, only variants created in the runtime adaptation. this worked like a charm, thank you. I have a trial version of Web IDE on premise. And, I can’t seem to find / use SAP Visual Editor or create an Adaptation Project for Fiori Elements. Do those features only exist on the Full Stack Cloud version of Web IDE? If so, how long will it be before the on premise version can have those features?